Ribbons and Red Tape: Emotionally and Legally: How do I know if a Horse is Right for Me? Emotionally and Legally: How do I know if a Horse is Right for Me? Both longtime horsemen and first time horse owners or lessees ask the same question: How do I know if a horse is right for me? Horse sales can often ride the fringe of unscrupulous dealings- there can be hidden commissions or agendas, or untruthful seller guarantees regarding the horse's health or skill level. Even in the best situations in which all dealings are honest, nothing can guarantee that a horse won't change after purchase. The horse may injure himself the week after you buy him, he may not like his new facility, or you may find that you and your new horse may not work well together as a team. 1. Whether the deal is the right one for you. This includes whether the horse is priced in your budget- can you make payments in one lump sum or do you need to pay on an installment contract? Is the horse's price an accurate reflection of his skill, experience, and health? Will his health and training needs fit into your financial plan? 2. Whether the terms are right for you. Does the purchase and sale agreement clarify any warranties or guarantees that are made on the horse? Has it been disclosed to you who is receiving commissions on the sale? Does your agreement specify what will happen if something goes wrong- such as mediation, arbitration, and attorney fees? 3. Whether the horse's health is right for you. Is your veterinarian unbiased? Have you communicated with your veterinarian what your needs will be for the horse? Have you requested that any questionable results in radiographs be read by a second opinion? 4. Whether you are the right team. Many barns do not allow their horses to go on trial, if so, have you made other provisions to get to know the horse? If you are taking the horse on trial, have you protected yourself with a trial agreement and insurance? I have found that the most reliable horses are found through referrals: people who know the horse and think it would be a good fit for you. Your trainer can help you find the right horse, a trusted friend who knows horses, or your vet may come across one that is for sale. Many people also find horses online, which carry their own legal concerns: is the horse fairly represented? If buying sight unseen, is the horse that arrives the same horse you purchased? What was the one thing that made you decide to buy/lease your horse? -I didn't want him to go to slaughter..... he was very close...... but now he is happy and healthy and a super athlete! -give me responsibility and keep me out of trouble! -Couldn't resist the moose ears and auto changes! -He was so willing to learn and his personality was like no other. I knew he was going to be great! -From the second I saw that add online I had to have him. So I emailed the trainer and fell in love instantly. I rode him once and we bought him the next day. Many of the answers come from an emotional response to the horse, which of course is a very important element in your ownership and partnership with the horse. However, always ensure that the rational response is also involved and consider the legal and business perspective. 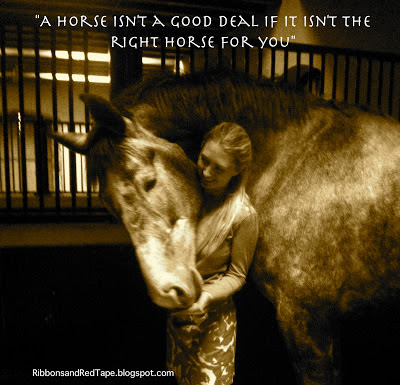 As I repeat to all my clients, "A horse isn't a good deal if it isn't the right horse for you." So what is the one thing that made you want to purchase or lease your horse? Did you consider both the emotional, the legal, and the rational?